2017 was the year of planning for SAP HANA. Will 2018 be known as The Year of The HANA Upgrade? SAP has done an exceptional job of incentivizing customers and sales reps to migrate to the latest suite of SAP applications – most notably S/4 HANA, HANA, and BW4/HANA. Which application is a top priority for you to upgrade, ERP or EDW – Enterprise Data Warehouse? What are some of SAP’s clients saying about their road to HANA? Are they realizing the business benefits of migrating to a HANA-based platform? The expectation is that HANA will deliver process and performance improvements that speed up transaction processing and reporting. Simply, HANA is about performance and data volume. Because of poor data management policies, some customers are not getting the performance. Is this HANA’s fault? ILM, Information Lifecycle Management is a major benefit of migrating to HANA. However, many customers either do not have an ILM model or their practices are not current. First, what is ILM? ILM is the segmenting or tiering of data based on criteria such as usage, relevance, compliance, and others. You usually hear this referred to as Hot, Warm, and Cold data. Since HANA uses in-memory storage and a premium is paid for this storage, it is in your best interest to segment your data to pay only for what you need. One recent adopter had a 15 TB DB. Can HANA handle this efficiently? Maybe, maybe not, according to our sources, it depends on how the data is managed. Before the upgrade, we recommended that they archive their data. Archiving is another form of tiering, making the archived data cold or off-line. This customer did not archive their data and the result – slower than expected reporting and transaction processing. After the upgrade, reporting efficiency and duration did improve, but not as expected. SAP suggests that you will get up to an 80+% improvement due to the HANA and S/4 simplified data scheme. They were only getting a 30% improvement. Data analysis and preparation should be performed before the upgrade. Define your data according to the three tiers. 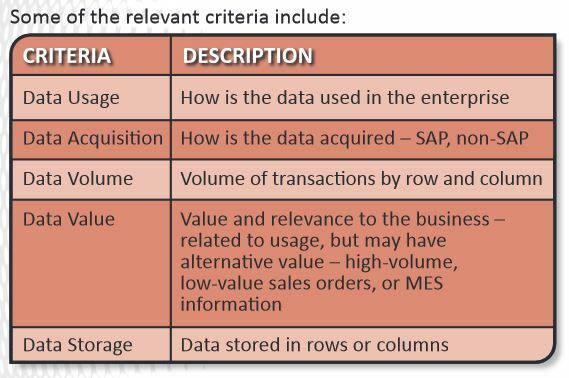 Do this analysis and it could dramatically impact your HANA sizing exercise; Enterprise HANA, BW4/HANA, or S/4 HANA. The exercise can take between 2-days to 2-weeks. We recommend including stakeholders from both business and IT in the workshops. However, a deep dive into some data statistics on volume, frequency, and type can streamline the analysis. The criteria to assess your data is common, the approach and results are unique to each customer and industry. Each customer, business, and environment evaluates their data differently. Using this criterion, segment the data into Hot, Warm, and Cold. 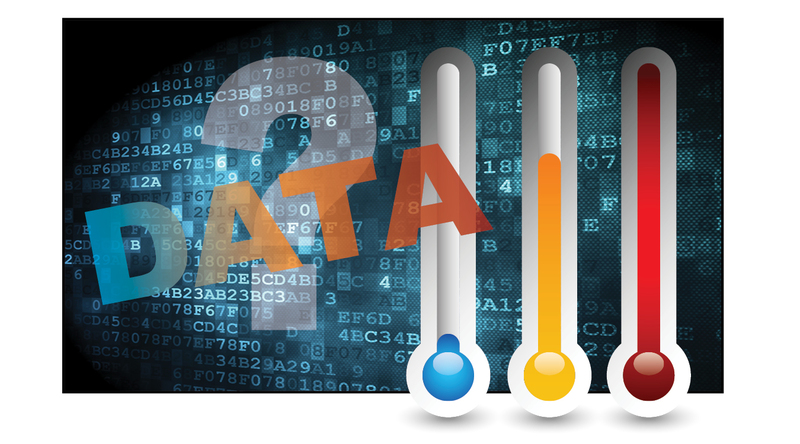 Typically, Hot and Cold data is easy to define. The grey area is with Warm data. And this definition may change based on the business function and processes; financial data has a different scoring or weight than operational data. Hot data, or Tier 1 data, is recently acquired data relevant for months or years. Hot data benefits from the HANA in-memory computing and capabilities. This is the data that HANA manages best for performance and speed. Warm data, or Tier 2 data, compressed, but disk-based rather than in memory, but needs to shift from warm to hot in short order. Cold data, or Tier 3 data, is lower cost and value data and commonly extracted using Vora or Hadoop, for example. This data is stored off-line with lower cost platforms. Once you have performed this exercise prior to the upgrade, take periodic snapshots to see if your assumptions on the criterion has changed. Recent articles spoke of the importance of archiving. Start with the archiving strategy you have in place and evolve it towards ILM Best Practices. If you do not have an ILM strategy in place or need an experienced team to review your strategy or upgrade plan, contact Mark Vasinda, mvasinda@titanconsulting.net, 972.977.3100; or your Titan Consulting Sales Director.